Peter Smith, brother-in-law and partner to the more famous Robert Hoe, introduced his press around 1821, positioning it to compete with the press invented by John Wells, the Wells. Wells in fact accused Smith of patent infringement, as the toggle mechanism of the latter’s press closely resembles that of the former’s, patented two years before. The first Smith presses had cast-iron acorn-shaped frames (like the one pictured). 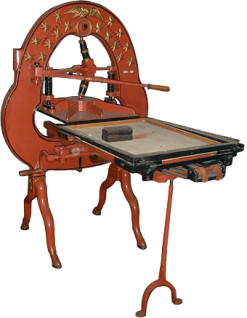 Though the Smith is often associated with such a frame, it is not the frame but that hotly debated toggle mechanismthat distinguishes it from other presses–with the notable exception of the Wells–some of which also had acorn frames. The mechanism in question, found on both presses, is a joint into which is forced a wedge when the bar of the press is pulled. The inclined members of the joint, both equal in length, are forced upright by this wedge, which in turn pushes the platen downward with a good deal of force. Smith died in 1823, just two years after the introduction of his press. In 1835, Hoe, still manufacturing the Smith press, acquired the rights to his strongest rival, the Washington press, and thereafter built the Smith toggle into the upright frame of the Washington. The Smith was still manufactured as later as 1880, although it was always a second-runner to the Washington. The Smith pictured was made in 1822 by the Cincinnati Type Foundry, which made various presses (see also the Stansbury). Pratt Wagon Works has made a faithful reproduction of a Smith, on view in the Museum.